Partly to mostly cloudy. A stray shower or thunderstorm is possible. High 78F. Winds S at 10 to 15 mph.. Scattered thunderstorms. Low 53F. Winds ENE at 10 to 15 mph. Chance of rain 60%. 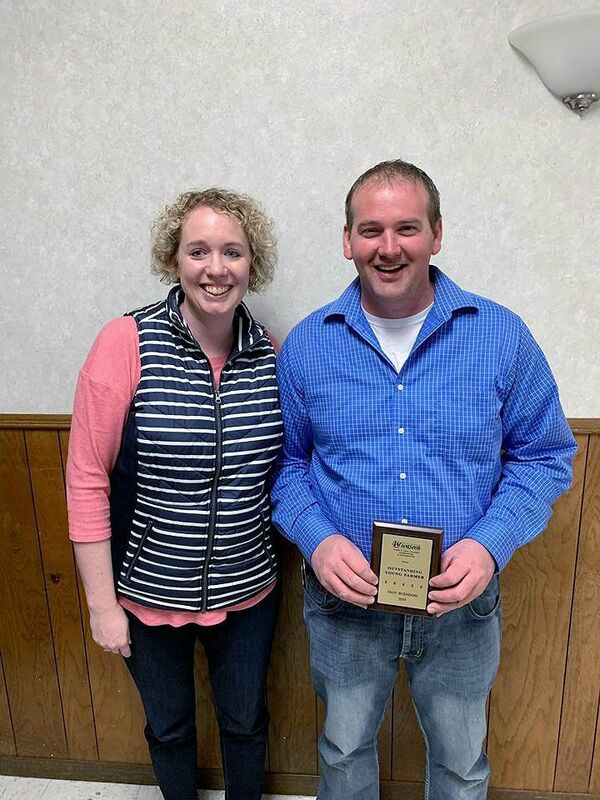 Sarah and Paul Berry were awarded Waseca County Farm Family of the Year. Waseca Area Chamber of Commerce AgriBusiess Committee and Ambassadors awarded Waseca County residents with Farm City Awards. These awards were given out at a luncheon on Thursday, March 21. Paul Berry grew up farming with his grandparents, George and Goldie, and his parents Roland and Helen Berry. He and his brothers and sisters spent many hours on the back of the M, on the floor of the cab, doing hog, dairy and sheep chores and a small calf herd and helping with the crop farming. In the 1980s Paul began his own operations acquiring some acres during the economic hardships. He has a small dairy set up on his grandparents home site and 80 acres. He also rented his parents remaining land. He and his first wife Jill (Guse) Berry grew the operation and decided to sell the dairy herd in the 1990s to focus on the crops and fed cattle. Currently Paul crop farms using precision planting, sharing equipment with Ivan and Janice Maas. There is a small herd of fed cattle and a small lambing operation. There is always a large vegetable garden and honey bees. 4H and Future Farmers of America animals come and go, including chickens, rabbits and ducks. The family is involved with different aspects of the farm operation. Roland Berry is retired but still helps drive truck and purchase bees and market the honey. Helen Berry helps with that as well, along with preparing meals and garden weeding. Paul Berry does all operations — managing the farm and finances. Sarah Berry helps with support and cooking when time allows with her full-time job as Waseca County Public Health Director. Paul and Sarah Berry’s five children help with chores and the animals when they are able to. Paul and Sarah are active in the community as well. Paul provides space and does occasional chores for 4H animals. He is a member of corn and soybean growers, active with ethanol production and as a shareholder helped recruit judges for 4H premier showmanship. He has served on Soil and Water Conservation Board in the 1990s. Their daughters were members of 4H and their son was an Eagle Scout. Sarah is heavily involved with music at the church in the community. Both Paul and Sarah have served as chaperones for church Mission trips. To be recognized as the outstanding young farmer there are a few requirements. This person must be between the ages of 21 and 39, use innovative methods to farm, show steps of improvement in their operation, service the community, organizations and conservation practices and be deriving two-thirds of their income from the farm. Troy is a 36-year-old full-time farmer. He is married to Theresa Buendorf, who he is raising three daughters with. He also serves on his church board and coaches his daughters sports teams in the community. He has been around the farming environment his entire life, purchasing 140 acres with his brother Chad Buendorf and farming 1,275 acres as a family. For innovation on his farm, Troy uses software the family purchased in 2017 that tracks product application and harvest information per field. This technology also tracks the soil composition and yields throughout the entire field, showing the lowest yields and where they are best. Troy has improved his farm operation by adding diversity. He did this by building his first hog barn in 2014 and his brother Chad built the second one in 2015-2016. Troy cares for both barns using the manure on the acres they own having purchased a tank and injector bar so they could apply the manure themselves. He was born in 1923 and graduated from Waldorf high school having farmed with his father after graduating. He married Darlene who he raised five children with on the farm and now has nine grandchildren and seven great grandchildren. With the help of their son Marty Tesch they grew their 240 acre farm and dairy herd to more than 100 cows, which is operated by Marty today and principally used to raise corn and soybeans. Armin was selected for this award for many reasons. The biography also says the community in which he resides believes in him as a competent and reliable friend. He is admired as a family man and his commitment to his family and their own successes. Transferring the farm successfully from one generation to the next may be one of the most difficult challenges for many but in this family’s case, the transfer was evident. Armin and Darlene Tesch have been prominent members of the community. They have been active in the State and County Farm Bureau with Armin serving as the county president. He has earned a life membership to the Farm Bureau. He has spent his entire life committed to agriculture and has been recognized by the Waseca County Soil Conservation District for his leadership and successful application of soil conservation farming practices. Outside of farming he has been active in politics serving as co-chair of the Minnesota First Congressional District Republican Party Committee. He has also served as a voting delegate to the Republican National Convention and appointed by Governor Pawlenty to the board of the Minnesota Rural Finance Authority. The biography also says that Armin has a philosophy to “do the work first”. By this he means that it is important to keep out of the weeds, meaning, working where it is most important, not working on things that in the end will not matter. 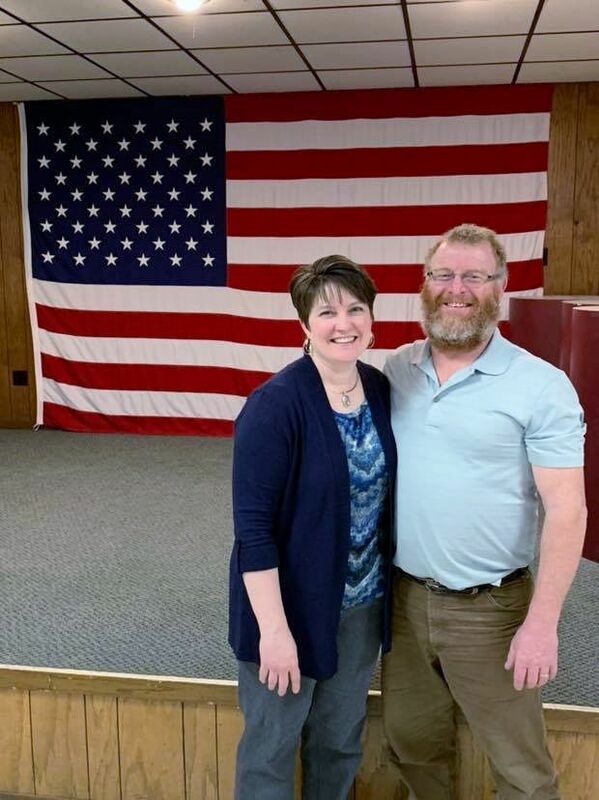 Along with family, farming and politics Armin, along with Darlene, are members of the First Lutheran Church of Waldorf having served as elder, vice president of the church board and a Sunday school teacher. They have also been involved in mission work, including recovery efforts following Hurricane Katrina, and helping build a church in Sterling, Alaska. Scott began farming in 1983 while he was still in high school having rented 260 acres from his father, Merlin Hildebrandt, and purchased a tractor and planter. After graduating from the University of Minnesota, St. Paul in 1991, he took over the operation by purchasing his first farm. Scott and his wife Peggy Hildebrandt and their two daughters, Paige and Emily, have been active in the community throughout the years. He now owns 740 acres, primarily for planting corn and soybeans. In 2012 his operation grew with the addition of a 3,000-head swine barn that he currently operates. Scott has been a resident of Waseca County for 51 years and has been actively involved in Waseca County agriculture for 35 years. He was awarded the Waseca County Outstanding Young Farmer award in 2000, going on to win the State contest in 2001, and in 2002 named the winner of the National Outstanding Farmers of America award- the “Crown Jewel” award for outstanding U.S. farmers. From this recognition he was chosen to serve on their Executive Board from 2005 to 2008 and was elected president of the Outstanding Farmers of America from 2009 to 2011. Other agricultural activities included being selected to serve on the Southern Research and Outreach Center Advisory Committee from 2009 to 2014, being elected Chair from 2015 to 2017. Hildebrandt was also appointed to serve on the Waseca Co. Soil and Water Conservation District Board in 2015 and recently served as Vice-Chair, 2016 to 2018. He also served on the Waseca County Fair Board for 10 years. Outside of agricultural organizations Scott served on the St. Mary Town Board from 2003 to 2011 and as Chair from 2012 to present. He has also served as a 20-year member of Waseca Co. Pheasants Forever serving as president for 10 years. Along with those organizations he served two three-year terms on the Rotary Stoltenberg Scholarship Committee to select a senior with strong participation and leadership in high school academics, arts and athletics and involvement in community activities for the scholarship. Reach Reporter Bailey Grubish at 507-837-5451 or follow her on Twitter @wcnbailey.